I pray for those who died in the World War. Let their souls rest in peace. I pray for them in heaven. On Monday 2nd July, Year 3 children went to Kingsbury Water Park for their end-of-year class trip. Kingsbury Water Park is a country park in north Warwickshire, England, not far from Birmingham and lying on the River Tame. It is owned and managed by Warwickshire County Council. It has fifteen lakes situated in over 600 acres of country park. On the 19th October 2018, the children used various materials to make switches and tested them in their circuit to see if they worked. Year 4 have been thinking about Remembrance day and, particularly significant this year, the centenary of the end of the First World War. We have been learning about not just soldiers who came from all around the world to fight but also those who were left at home. We learned about how children, women and men who were too old to fight, helped the war effort. Some of the children did their own research at home including finding out about their own relatives who were affected by the war or fought in the war. We have listened to songs and read poems and diaries of people from the time. As we reflected on the end of this war, which at the time was described as and hoped to be, the war to end all wars, we wrote letters of thanks to people who were alive at the time. Then we created pictures using silhouettes and beautiful sunset colours, to remember, lest we forget. 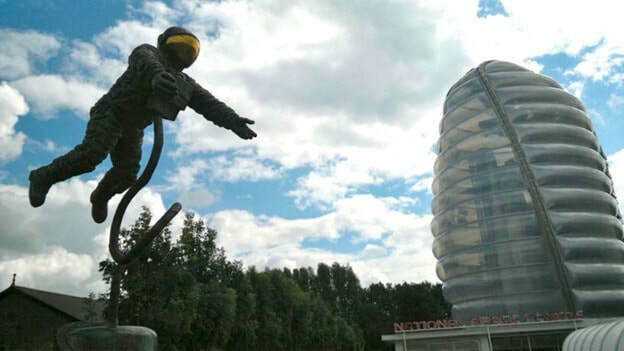 On Tuesday 12th June, Year 5 went to the National Space Centre for their end-of-year class trip. For some more fun, put your helmet on! ​And Kingswood would not be Kingswood without its famous Disco night! ​Time for bed, now? NO! Time for hot chocolate and a camp fire.